Warm meringue? Seriously? She’s off her trolley. It’s meant to be cold with cold, whipped cream? 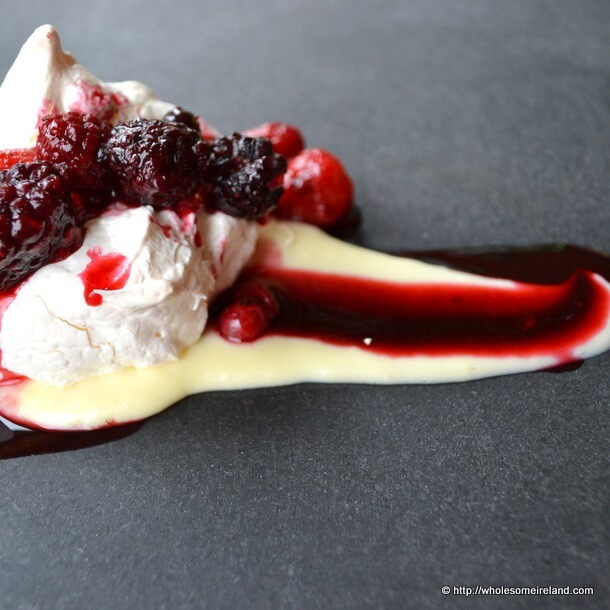 Why on earth would you eat Warm Meringue with Custard and Berries? The thing is meringue and custard go so well together because you use the egg whites for the soft, pillowy, melting, chewy, slightly crispy peaks of snow, then you use the egg yolks for the silky, luscious custard. The fruit, slightly warmed in its own juices becomes the tart counterpoint to all the sweetness. Himself, being the self-proclaimed expert of all things meringue, thinks this is my best version of meringue yet. Apparently, I have still to accomplish the peaky standards that my Aunt M sets regularly! I’m not convinced that he says this to get me to make meringues more or whether this is the whole truth. I only know that I’m not likely to challenge her to a meringue-off soon. This is quite a frugal dessert. There are very few ingredients in this recipe. If you forage blackberries or similar from hedgerows in the Autumn and keep them in your freezer then you only need to take out what you will use. The cost then comes down to the amount of sugar, eggs and milk you use, a small spoon of cornflour and a drop of vanilla extract brings up the rear. I’ve used my handy online shopping tool and to make Warm Meringue with Custard and Berries costs €1.50 for 4 portions, providing your berries are foraged. Rounded up this equates to 38c per person. Note, my recipe allows for free range eggs, high quality vanilla extract and milk. There are savings to be made if you are prepared to compromise. Preheat your (fan) oven to 140 degrees Celcius and line 2 baking trays with greaseproof baking paper. Separate your egg yolks and whites. Make sure there is no yolk in the whites. Decant the whites into a dry clean mixing bowl. Reserve the yolks and set to one side. Whisk the egg whites vigorously until they turn clear white and double in volume. Weigh out 80g of the caster sugar and add this spoon by spoon to the whisked egg whites. Whisking in between so that they are well mixed in. Spoon the meringue (I don’t bother piping for this recipe) onto the baking paper. Bake in the oven for 45 minutes. After 30 minutes, take the remaining 20g of caster sugar and the cornflour and stir into the raw egg yolks. In a heavy saucepan, warm most of the milk (reserve a little bit and add to the egg yolk mixture, then stir) until just close to boiling point. If it boils, remove from the heat straight away and allow to cool a little. Pour the vanilla extract into the milk. Add the egg yolk mixture and stir well. I use a whisk for this stage. Bring the milk and eggs back to a low heat and whisk until it begins to simmer, then turn off the heat and serve with the baked meringue. If you are serving with warm berries, then take a handful from the freezer and place in a microwave proof bowl. “ping” for 1 minute then stir. It shouldn’t take much longer than this as they have a high sugar content so defrost very quickly. The high sugar content makes them more conductive to heat. Ah! Never thought of using the yolks for custard… Just had an a-ha! moment!!! Precisely. Waste not etc. I normally always use yolks for custard or for fortifying a sauce but rarely put it warm with fresh meringue from the oven. Caítríona, this looks absolutely divine! And the fact that it’s thrifty makes it all the better. Lovely. Thanks Aelish. Thrifty is always good in my book! Mouth is watering now, that looks feckin yummy Caitríona. I’m a big fan of thrifty meals. I used to keep the yolks for mayonnaise though recently I found a recipe using the whole egg for mayo, worked a treat.